The most advanced Wi-Fi multiplexer on the market: sharing on board data made easy. Take your boat under control. The most advanced multiplexer bi-converter Wi-Fi able to handle the NMEA2000 and 0183 protocols simultaneously. Getting old and new instruments to communicate is never simple. Add Wi-Fi into the equation and you can expect a world of woe; unless of course you opt for a multiplexer. The GAMP 2000 converts NMEA0183 data to NMEA2000 and vice versa. The clever box of bits than transmits all the data via Wi-Fi so you can view it using a smartphone or tablet. So if you have your AIS data and a heading sensor on NMEA0183, but your GPS and transducers on NMEA2000, it matters not. The GAMP 2000 has four NMEA0183 inputs where the baud rate can be individually configured, and one port for NMEA2000. The unit has a Micro SD card port so you can record your navigation data and review it using Astra Yacht’s free iOS app. It’s also available with a built-in GPS. Through the GAMP2000, it is possible to connect together instruments based on different protocols: join the new tools to the old ones without expensive translators. 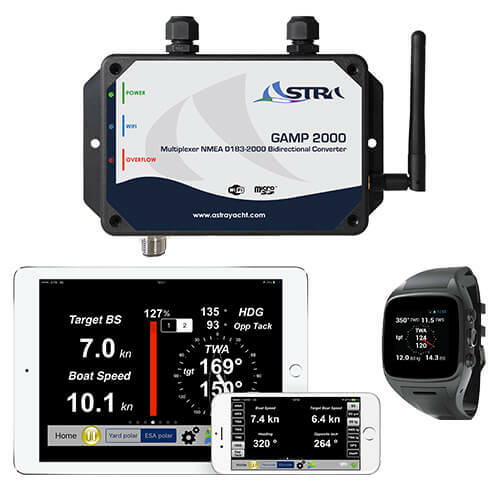 GAMP2000 is able to manage both the instruments systems based on NMEA2000 and 0183, achieving a never seen versatility, and transmitting all the data on board, both online and through Wi-Fi. 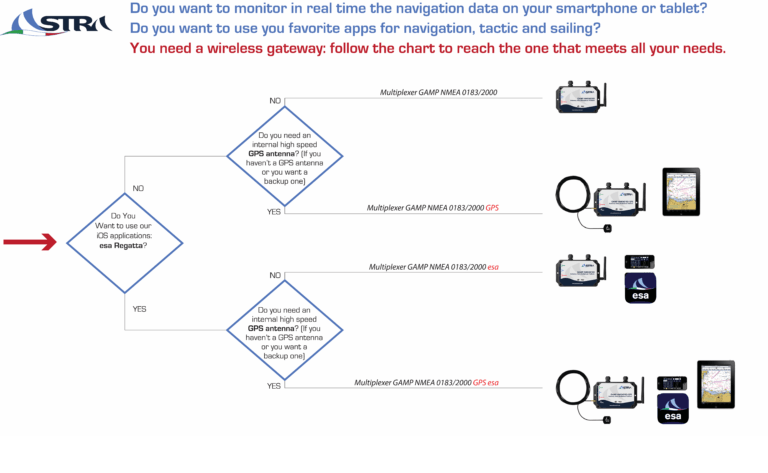 Thanks to the Wi-Fi transmission, GAMP is a router multiplexer access point NMEA and it is compatible with the most common nautical apps for smartphones and tablets. The GAMP2000 can record the navigation data of your sailing sessions giving you the possibility to analyze them later. 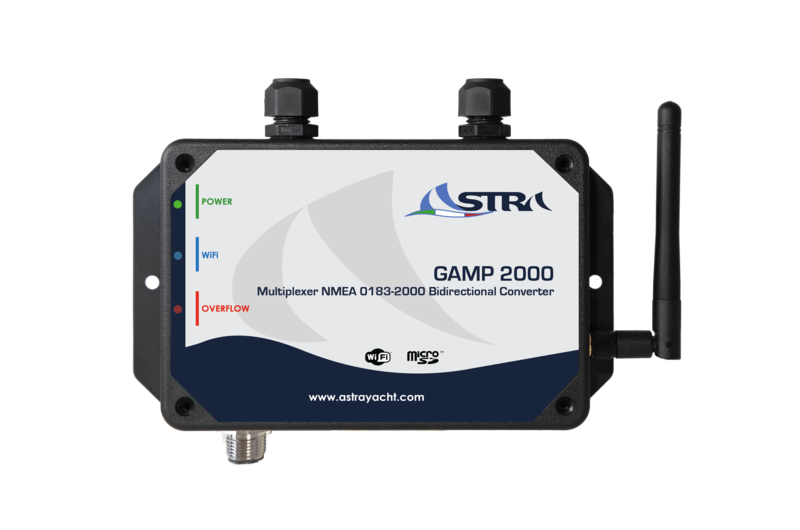 GAMP is able to connect and manage all the instruments systems based on NMEA 0183 and now NMEA 2000 standard. No other transducer required. GPS, AIS, automatic pilot all together connected and output data available via NMEA 0183 or 2000 out, wired and Wi-Fi. The collected data are processed and transmitted through Wi-Fi in NMEA0183, to be used by desktop applications such as navigation programs and mobile application like esa Regatta. It supports AIS and NMEA signals up to 115200 baud. The multiplexer’s configuration and management software enables users to select wanted sentences, manages gates priority, defines various baud rates and selects the perfect filter for sentences, for a complete versatility and calibration of the on-board instrumentation network. Connect through Wi-Fi up to 4 devices simultaneously. dedicated version enabled to work with our iOS apps, esa Regatta and esa Training. See the image below to see which version of GAMP is suitable for the use you want to do. 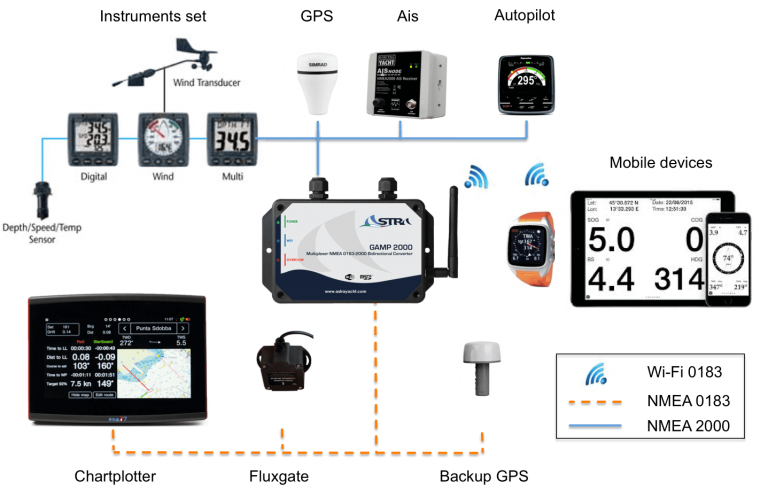 The free iOS app Astra Dongle Recorder enables GAMP NMEA 2000 users to manage navigation data recorded on the MicroSD directly from their iPhone, iPad or iPod touch. ASTRA Dongle Recorder’s manual is included in the GAMP 2000 manual.